In the bar, the term "rocks" refers to ice. When someone orders a "Scotch on the rocks," they are asking for a straight pour of the house Scotch served over ice. It seems simple, right? If you have been around the bar long enough, you know that things are never as simple as they seem. The Pros and Cons of Whiskey "On the Rocks"
Do you need to add ice to your premium whiskey? Will ice dilute the whiskey and ruin the experience? Is there a better ice option that will chill the whiskey without a lot of dilution? First of all, with any drink, there is not a right or wrong answer. If you enjoy it, then drink it. There are, however, legitimate arguments and instances that you may want to think about when exploring your options. The major disadvantage of adding ice to whiskey is dilution. It is only natural that ice melts and the longer you take to sip your whiskey, the more diluted it will get. We all know that ice is used to chill drinks; that is its primary purpose in the bar. For the right whiskey, though, it can also open up the spirit's flavors and aromas. A few pieces of ice can replace a splash of water in your whiskey while cooling the drink at the same time. Is Any Whiskey Okay on the Rocks? Choosing the whiskeys to be served over ice is going to be a matter of personal preference. Bourbon and Rye Whiskey. Many drinkers find that the watering down effects on a high-proof bourbon like Knob Creek makes it more enjoyable to sip. Others prefer the kick a whiskey like this gives. The same can be said for the flavorful rye whiskey options available today. A milder bourbon like Maker's Mark doesn't necessarily require any additions because it has a lower alcohol content and less bite. That said, its red winter wheat notes do open up with a hint of water. It is very nice to sip a chilled glass of Maker's after a long day, particularly in the summer. Scotch is a Different Story. Scotch tends to be a different matter, and you can read thousands of pages of advice on the matter. Most of the time, it is a matter of quality. You may enjoy a decent blended Scotch like Johnnie Walker Black Label on the rocks after work. You are, however, going to be less likely to request that coveted glass of the brand's Blue Label served the same way. Single malt scotch tends to follow suit. These whiskeys tend to be more expensive and rarer than their blended counterparts. It is common to serve them straight, with no ice. In reality, the majority of premium Scotch whiskeys are perfect exactly how they are bottled. There is no need to doctor them up, and if you do want to enjoy one slightly cold, chill your glass. All ice is not created equal. It is a statement that any whiskey or cocktail lover needs to wrap their brain around because it is true. The average ice that your bartender scoops out of the bin to shake up a Manhattan is not going to be the best choice for your whiskey on the rocks. It is small, dilutes very quickly, and is not guaranteed to be made with the cleanest water. Large. The more surface area an ice cube has, the slower it dilutes your drink. That is why ice balls and 2-inch cubes have become so popular in recent years. The history of the Old-Fashioned proves this is not just a modern preference. Clean. Not only should ice be made with the cleanest water available (pure spring water or distilled water), but it should be frozen away from things that contaminate it. Your Freezer Makes a Difference. On this last point, your home freezer is the biggest contaminator of your ice. If you are freezing your ice next to fish fillets you intend to cook for dinner, your ice is probably going to pick up fishy nuances. Some whiskey aficionados go to great lengths to keep their "whiskey ice" free from outside flavors. Something as simple as sealing ice trays in plastic bags can make a big difference. Make sure to throw out ice that has been in the freezer for too long. One week is a good general rule. Do you want the chill without the dilution? 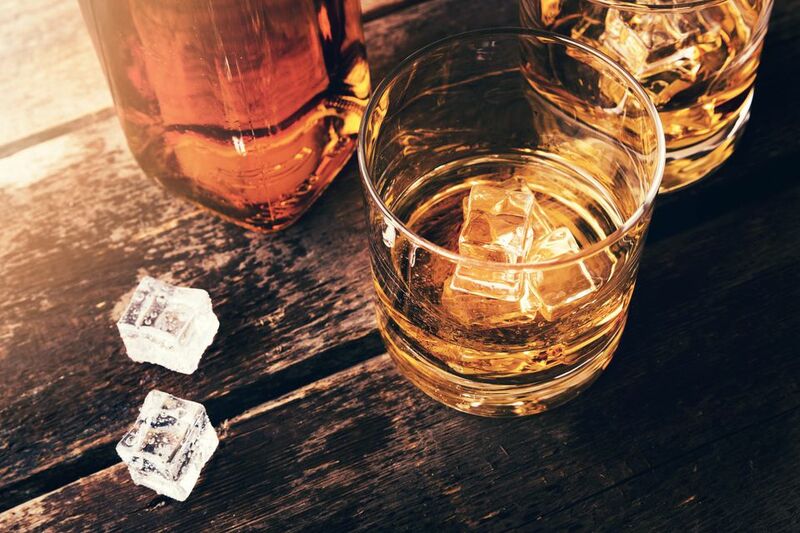 Beyond chilling your glass, there is a solution for that; whiskey stones, made of materials like stainless steel or soapstone, are tiny cubes that get ice cold in the freezer and can be added to any drink for an instant chill. They're quite nice and convenient for the casual nightcap. You have to remember to rinse them off after each use and refreeze them. Beyond Whiskey "On the Rocks"
"On the rocks" can also be used when describing the preferred way to serve a mixed drink such as a Screwdriver or Sea Breeze. Most often, this is used to describe short drinks like the Rusty Nail or Black Russian, though it can be used for those tall drinks as well. The 'Rocks' Glass. The association between ice and rocks extends to the type of glass used as well. Those short drinks we often call lowballs are served in tumblers called an old-fashioned glass. Many drinkers and bartenders will also call this a rocks glass and the larger version a double rocks glass. Now that we have dissected the term "on the rocks" to a great extent, there's another bar term that often goes along with this order: the "back." A "back" is nothing more than a tall drink that you order to accompany that whiskey on the rocks (or a shot of liquor). You might say, "I'll have a Scotch on the rocks with a beer back." With this request, the bartender would give you a glass of whiskey served over ice with a draw of beer. The "back" can be any tall drink—beer or a non-alcoholic option like water or soda that is served in a tall glass. It is a nice option for those times when you want to limit your alcohol consumption and enjoy a longer lasting drink while enjoying a straight sipper of whiskey.